We recently reported that Qdoba Mexican Grill would be closing about 20% of its corporate-run stores by the end of September. We didn’t know that it would happen this soon. And we didn’t know that Southern California would be a target. Fried white rice vs. fried brown rice…fight! White or brown? You have the power to decide. From July 3 through August 31, Panda Express will offer guests the option of either fried white rice or fried brown rice. Throughout the campaign, Panda will track the number of orders of both kinds of fried rice and post the results to its Facebook page. 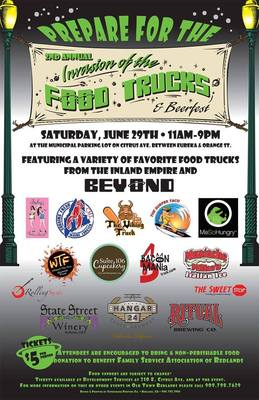 The Food Truck and BrewFest (aka the Invasion of the Food Trucks and Beerfest) returns to the Redlands Mall south parking lot from 11 a.m. to 9 p.m. on Saturday (June 29). It’s gonna be a scorcher, so it’s a good thing that Ritual Brewing Co. and Hangar 24 Craft Brewery, along with State Street Winery, will be on hand with plenty of liquid refreshment. Admission is just $5, and tickets can be purchased in advance at the city’s Development Services Office, 210 E. Citrus Ave., or at the door. Foodies and craft beer fans will want to take in the Claremont Village’s fourth annual Blues and Brews Craft Beer Walk, which takes place from 4 to 8 p.m. Saturday (June 29). Participants (21 years of age and older) will be able to tour the village and try food and drink samples from nearly two dozen participating eateries and sample beer from about 15 craft breweries. They’ll be entertained along the way by over a dozen bands. Cucamonga Pizza Co., 9659 Milliken Ave., Rancho Cucamonga, is donating 20% of its profits through Thursday (June 27) to the family of Lukas Clark, a 7-month-old apparent child abuse victim who died of his injuries on Friday. The pizzeria is open from 11 a.m. to 9 p.m. If you are unable to make it to the fundraiser and would like to make a donation to the family, you can do so here. Reporter Doug Saunders has the story here. Feisty Chicken & Grill has been open for a couple of months now, but it’s finally celebrating its grand opening Thursday (June 27) through Saturday (June 29). The small chain is celebrating with free food tastings and two-for-one specials. The Rancho Cucamonga P.F. Chang’s China Bistro, 7870 Monticello Ave., is hosting a fundraiser for the City of Hope tomorrow (June 25) evening. From 4 to 11 p.m., the restaurant will donate 20% of its sales (excluding alcohol and happy hour menu items) to the cancer-fighting organization. Since San Bernardino County overturned its ban on food trucks a little over a year ago, Riverside County has been the sole remaining county to still ban them from operating on a daily basis. County Supervisor Kevin Jeffries is starting a push to overturn the ban, and he’s leading by doing. There will be a food truck “rally” Tuesday (June 25) at the County Administrative Center at 4080 Lemon St. in downtown Riverside. I know what you’re thinking. Today is June 21. June 30 is nine days away. So Downtown Riverside Restaurant Week? Ah, the rites of summer…road trips to the beach, barbecuing outdoors, lounging poolside…and Panda Express switching to summer hours and giving night owls free food. This year’s giveaway is tomorrow (June 21). Night owls will be able to get a free order of orange chicken from 9 p.m. to close when they print or present this coupon on their mobile device.